As part of its strategy to create a new generation of hypermarkets, Carrefour has rolled out a new design in Italy. Meanwhile in Belgium, it has announced plans to trial an organic-focused store and a new express design. Carrefour Italia has opened an updated hypermarket in Portogruaro, which it says is aimed at simplifying the shopping experience. The 5,000 sq m store carries a range of 20,000 SKUs and focuses on quality, organic and food-to-go. There are more than 2,400 fresh products and 4,000 SKUs offered at a discounted rate. The store’s fruit and vegetable section has been expanded to cater for a larger organic offering, which will include products sourced from over 100 local suppliers. The store also includes a pharmacy, opticians, laundry and sushi area. Another feature of the store is the Barilla Pasta Corner, developed in partnership with pasta producer Barilla. The catering concept offers customers a variety of pasta dishes which can be consumed on-site. Separately, Carrefour Belgium announced plans to open 100% organic stores by June 2019. The retailer will initially open five organic stores in large urban areas, such as Brussels. The stores will include a selection of health-oriented products, such as those without gluten or lactose and will primarily target new customers. 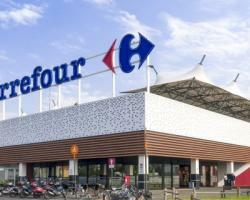 Carrefour Belgium’s general secretary, Geoffroy Gersdorff, commented, “We are convinced that opening a Carrefour Bio supermarket in 2019 is the next logical step. Not only to duplicate what already exists but to enhance our offer by proposing a qualitative experience”.